Different types of solvents are used in HPLC mobile phase used for different types of chromatography. These solvents are chosen on the basis of the stationary phase used for the analysis of the product. Perhaps we have already known HPLC, the high-performance liquid chromatography process that isolates, marks and quantifies the constituents of a mixture. HPLC is extensively involved in the pharmaceutical and other chemical industries. A pressurized liquid mixture contained in a solvent is passed under significant high pressure through a solid adsorbent column. Principally the process has two physical phases, solid and liquid. The solvent carrying the mixture is the mobile phase since it moves along the stationary phase or the absorbent column. We will be discussing the solvents used in the HPLC mobile phase as their selection determine how the analytes can be separated. The solvents used in the HPLC mobile phase are chosen on the basis of the type of HPLC selected for the purpose. There are two types of such HPLC executed in the adsorbent column. the solvents are used accordingly. Normal Phase HPLC separates the analytes using their varying degree of affinity to the phase which is polar by nature. Non-polar solvents like chloroform, cyclohexane, benzene, carbon tetrachloride etc. are used. Those boost the migration of the pole attracting analytes to the column as the solvent is lipophilic, i.e. doesn't pull back the polar analytes. Thus the use of a non-polar solvent increases the retention time of the analyte in the adsorbent. However, normal phase chromatography has declined in usage in HPLC due to its disadvantages like poor retention time for its solvents used in HPLC mobile phase. Reverse Phase Chromatography is extensively applied for HPLC now. Reverse Phase HPLC exploits the attraction of the analytes to the lipophilic or non-polar stationary column. To ensure the solvents aid the process of adsorption by not pulling back the analytes rather push them towards the stationary phase by repulsing, polar solvents are used. If the solvent is polar, it won't pull back the constituents of the mixture when they tend to move away due to non-polar affinity. That's why a polar solvent increases the retention time for non-polar constituents. 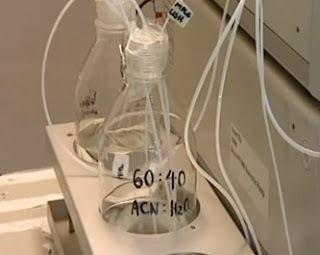 Upon enlighting on RP-HPLC solvents, the most common is water aided by an organic booster or modifier, e.g. methanol or acetonitrile. Other organic modifiers (organic solvents) can also be used with water. There are two key objectives in a trial HPLC. The first one is to ensure the analytes are entirely held in the stationary phase for the initial mobile HPLC phase. Lastly, to see if the all the analytes have eluted when the mobile phase strengthens sufficiently. A weak solvent is purposely used for a mobile phase to retain and hold the analytes. RP chemistry terms this as a low organic modifier with the aqueous phase. Specialists recommend not to use water more than 80% to 90% to avert column dewetting. Again, a larger presence of the organic solvent results in an RP of a weaker capacity factor. Thus the selection of Solvents used in HPLC mobile phase is very much crucial and demands a deeper focus. To retain the analytes completely, you can use methanol instead of acetonitrile. But in case of too much strongly retention problem, stronger modifiers like isopropanol or tetrahydrofuran work well. Overall, the selection of a solvent used in HPLC mobile phase not completely dependent upon the adsorption and separation process. Rather, the composition of this mobile phase solvent is crucial and consonant with the detector applied in the analysis.